If you upgrade and install to latest and newest version of PokeGo++ 2.0 (notoriously version r12), the Pokemon Go game may crashes while starting and loading, or force close and exit suddenly after playing the game for a while, such as catching few Pokemons, spinning few PokeStops, or engaging in couple gym battles. It looks like there was a crash! This newer version of the app might not be supported by the tweak YET. Downgrade the app with App Admin until the tweak is updated to continue using the tweak. The options that are available when PokeGo++ 2.0 crashed is Downgrade, Try Again or Cancel, which in most of cases, done nothing to resolve the issue. The PokeGo++ 2.0 crashes is usually caused by major changes been made on PokeGo++ 2.0 and any existing or residue settings, configurations or caches from previous versions may conflicted and crashed with the new version. Thus, if you’re facing the Pokemon Go crashing issue, try the following guide to fix the annoying problem. Download PokeGo++ 2.0 IPA (see Step 3 for instructions and link). This step will delete all saved locations in PokeGo++ 2.0. So if you have any saved locations (fake location or favorite locations in Map), remember to export the coordinates for backup. To do so, firstly enable the Show Coords Button on Map option in Settings. Next, open the favorite location one by one, then tap on Current Coordinates icon, and copy the coordinates to save it in a text file. If you’re teleporting at another location, you should save your faked location coordinates too. Delete any existing Pokemon Go app on the iOS device (iPhone, iPad or iPod touch) – including any tweaked or original versions from Niantic Labs. Pokemon Go game should run properly. If you’re teleporting at another location, before logging in, remember to enable Fake Location, Enable Teleport and Show Coords Button on Map, and use the Map to teleport to your previous location. For Favorite Locations, use the mass import tool in the Map to re-import them. Uninstall everything related to Pokemon Go, including the official app. You may want to backup your saved locations first, see Step 2 for non-jailbroken iOS devices. Install Poke Go ++ 2.0 with all its required packages (xCon, Pgpatch, uasharedtools – these additional packages not required for newer versions – plus the Tweak itself) which will be installed automatically. When done, respring. Install PoXemon by W00dL3cs (https://w00dl3cs.github.io/repo/). When done, respring. Install official Pokemon Go app. Restore any saved locations using the mass import tool in the Map. Poke Go ++ 2.0 does not work properly in iOS 8 and iOS 9. For non-jailbroken iOS devices, it’s recommended to upgrade to iOS 10. For jailbroken device, PoXemon should help with the issue. 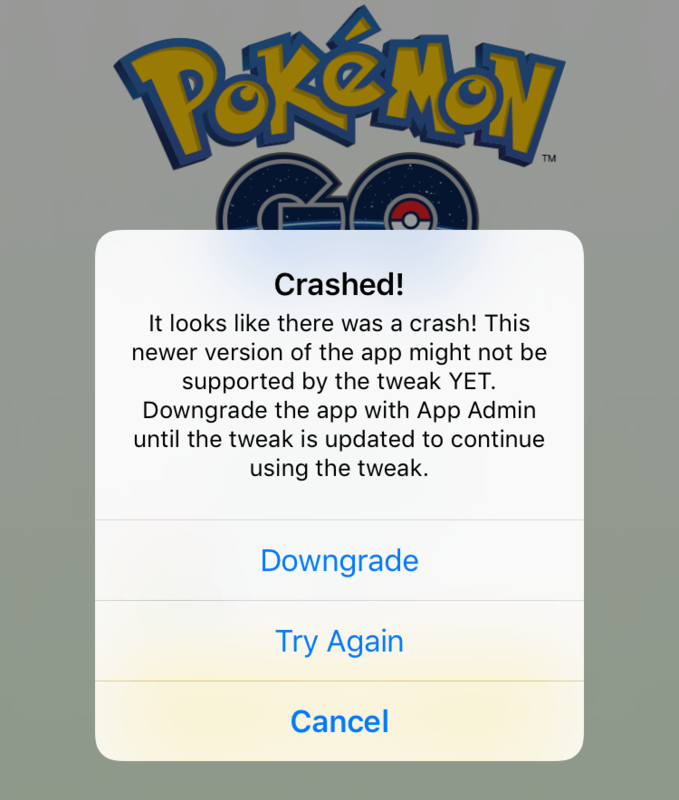 If you still encounter the “Crashed!” popup, tap on “Cancel”, and then tweak should still run. If the Poke Go+ tweak functions do not appear, try switching to the home screen and then back to Pokemon Go.